Google on Thursday released its Wallet transaction service for Apple's iPhone, giving users the ability to transfer money and store loyalty cards on their smartphone. The debut of Google Wallet comes as the search giant has switched it service away from reliance on near-field communications for its services. Previously, Google Wallet was only available on select NFC-capable Android smartphones, and was used for contact-less payment. Apple has not embraced NFC technology, and instead has turned to Bluetooth Low Energy for short-range secure wireless connectivity. For example, the new AirDrop feature in iOS 7 uses Bluetooth to scan for nearby devices, before automatically switching to Wi-Fi for a faster file transfer. Google Wallet was updated for devices running Android 2.3 or later earlier this week, granting functionality to all handsets whether or not they feature NFC connectivity. To date, adoption of Google Wallet has been low, partially because of the lack of NFC-capable payment kiosks, but also because U.S. carriers have banned Google's payment service in favor of their own forthcoming offering, dubbed ISIS. The new Google Wallet for both iOS and all Android devices gives users the ability to transfer money to another user's email address, similar to PayPal. Money transfers through Google Wallet are free, and can also be sent through Gmail. 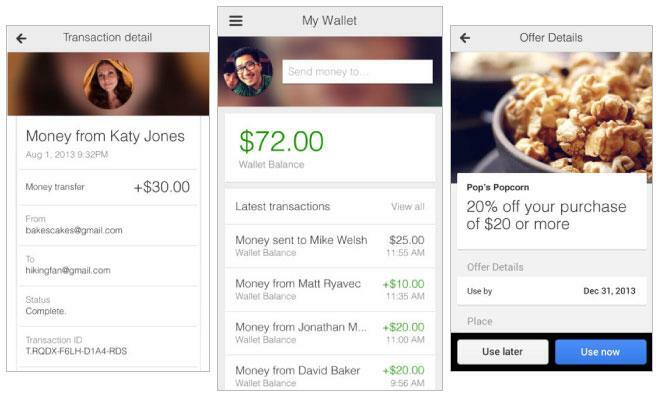 In addition to credit and debit cards, Google Wallet for iOS also allows users to store loyalty programs. Offers at specific stores can be redeemed through the application. The new application is an 8.6-megabyte download that requires iOS 6.0 or later. It's compatible with iPhone, iPad and iPod touch, and is optimized for the 4-inch display on the iPhone 5, 5c and 5s.